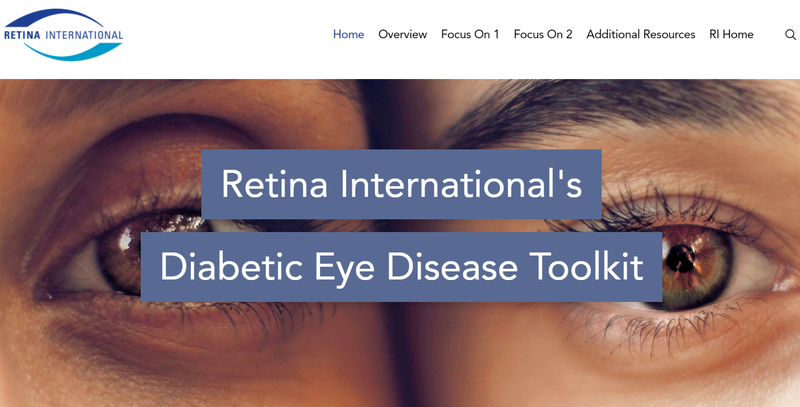 We are delighted to announce that Retina International, on behalf of RETINA ACTION – A Global Initiative for a Lifetime of Vision, have launched our educational Toolkit on Diabetic Eye Disease. Retina Action is a global initiative of non-government agencies, charities and foundations who are concerned with issues relating to vision loss in our ageing population. Retina Action acts as a Special Interest Group (SIG) that is facilitated by Retina International, with input from eight other groups involved. The educational toolkit on diabetic eye disease (www.retina-DED.org) is produced by Retina International and was designed as an online educational toolkit providing in-depth information on this complex condition. It is complimented by Retina Action’s existing Age-Related Macular Degeneration (AMD) Toolkit (www.retina-AMD.org) and it is the fourth Toolkit produced by Retina International, joining those for Inherited Retinal Diseases (www.retina-IRD.org) and Genetic Testing (www.retina-international.org/genetics/). Over 400 million people around the world are living with diabetes. Of these, 145 million develop some form of Diabetic Retinopathy, and of these, 45 million people are at risk of losing their sight. Diabetic Retinopathy is in fact the primary cause of preventable vision loss in adults aged 20-74 years. While management of diabetes and therapeutic interventions are available that can prevent or delay onset and progression of Diabetic Eye Diseases, many people affected by diabetes are not aware of these benefits. For individuals and families who have been diagnosed with diabetes, access to relevant, detailed and clearly understandable information that can improve outcomes for diabetes-related eye conditions is essential. www.retina-DED.org provides relevant and accurate information to patients, their families and health care professionals on Diabetic Eye Diseases. The patients’ voice in the tool kit highlights the benefits to the patient of being informed and knowing what can be done to improve your situation. · Managing their diabetes to prevent or delay the onset of Diabetic Eye Diseases. The Toolkit has been developed for the benefit of our members. All our Toolkits are provided to be used freely. Please use any part of the sites and content as you wish, and feel free to share the link www.retina-DED.org with your local organisations and members in order to educate and empower your communities. We endeavour to keep the content fresh and live with up-to-date information, and so we welcome your comments and suggestions of additional content or topics. Our President Christina Fasser said “This toolkit was designed to provide both patients and professionals with clear and trusted information on Diabetic Eye Diseases. We hope this site can help them to understand their condition. We hope that it will also empower global advocates by delivering up-to-date information that can assist them in their work improving the lives of those affected by these conditions at a local, regional and global level”. To contact us with questions or comments about the Toolkit, please email: Orla Galvin orla.galvin@retina-international.org. For media queries, please contact: Sarah McLoughlin sarah.mcloughlin@retina-international.org.